The line between magic and skill displays is real but not as clear-cut as some would think. 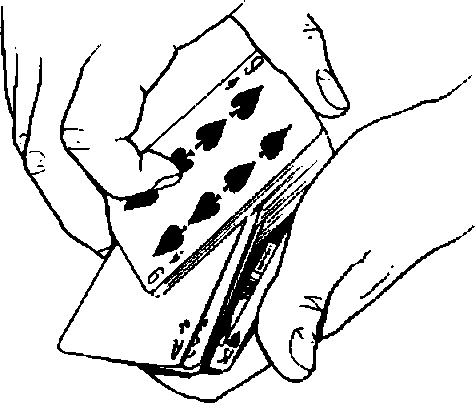 This point was illuminated, perhaps unintentionally, by Eugene Burger's column in the June 2000 issue of Genii entitled Ter/orming Stunts and Performing Magic." The article set out to point out the differences between the two. For me, however, it also highlighted some similarities. From the context, it's apparent that by 'stunt" Burger means a demonstration of skill. Because I feel that this is a loaded term 111 use the more value-neutral term "skill display," By contrast to such skill displays. Burger describes magic as "that moment of stunned silence that appears when we come face-to-face with something that we absolutely believed could not be," What struck me about this quote is how perfectly it describes what happens, not only in a strong magic effect, but also in a strong gambling routine like Shark Attach.